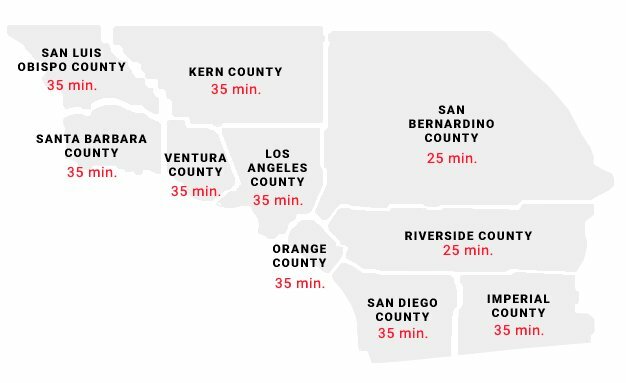 FASTEST RESPONSE TIMES IN OC & SOCAL! When you need a rooter in Orange County, call on RooterEX, day or night. Our full-service plumbing company provides effective, long-term solutions for your clogged, backed-up, slow-moving, and/or blocked pipes and drains. Whether it’s a quick job with a power auger or an extensive sewer pipe replacement project, our team has the skills, experience and know-how to get the job done. Our large team of expert technicians have seen everything Orange County can throw at it, which means fast, efficient service with all workmanship guaranteed. We provide rooter services to residences and commercial enterprises, big or small. From a clogged toilet in your home to backed up drains in your laundry facility, we’re on it. Our team is available around the clock to take care of any clog, overflow or draining emergency for your home or business. We typically respond to your rooter emergency within 64 to 99 minutes, depending upon your location. We tackle the big jobs, too, including major sewer line repair or replacement with advanced technological approaches and methods. Our team is equipped to deliver long-term solutions to your serious rooter issues, from hydro jetting to trenchless sewer repair. Your clog or slow-moving drain may be the sign of a bigger problem – like a damaged, leaking pipe. Our team performs thorough inspections to uncover hidden issues that are causing your plumbing problem.